If you want to understand what a Japanese wants to say, listen to their hearts and not their words. When I first came to live in Japan, I was told this by many of my close Japanese friends. I couldn’t understand it at all. I mean, as a westerner, and a male, it made no sense to me… It didn’t make any sense to me for the first 15 or 20 years of my living in Japan. My reasoning went like this: How was I to understand what someone is thinking when their words tell me a different story? I am not Houdini or some sort of clairvoyant mind reader! 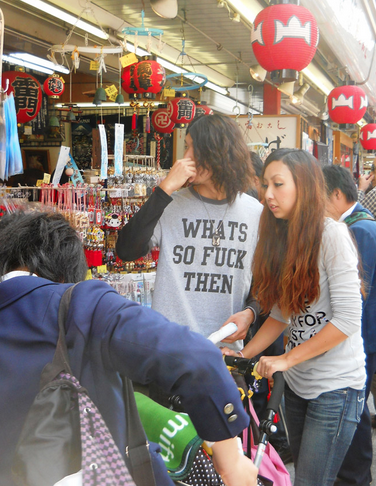 It is often said that Japanese people never say, “No!” Also they never say what they really mean. It’s true: Their true meaning is not in words spoken from their mouths, but not from their hearts. My very close friend left Japan many years ago and never returned. Recently, I’ve had two dear friends visiting from overseas for work. I witnessed this saying in action yesterday twice within the span of a few hours. We held almost all the speech in Japanese. It went well. A success. Once again, any rationally thinking westerner would hear that and shake their heads in agreement. It was like a huge balloon filled with the hot air of tension deflated right their on the spot. Our there Japanese hosts suddenly allowed their backs to relax and they slightly sank back into their seats knowing the deadline Sword of Damocles wasn’t hanging over their head at that very moment. I felt good that I could understand what these two cases really wanted to say when they spoke. It was very satisfying. From understanding their hearts, I immediately build a bond of great trust and a sort of acceptance and intimate understanding that the Japanese have with each other. It was wonderful that my two foreign friends could witness this first hand when they were here. 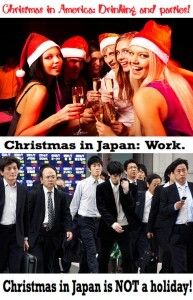 If all of us foreigners living and working in Japan remember this, it makes working and living with the Japanese all that much easier. 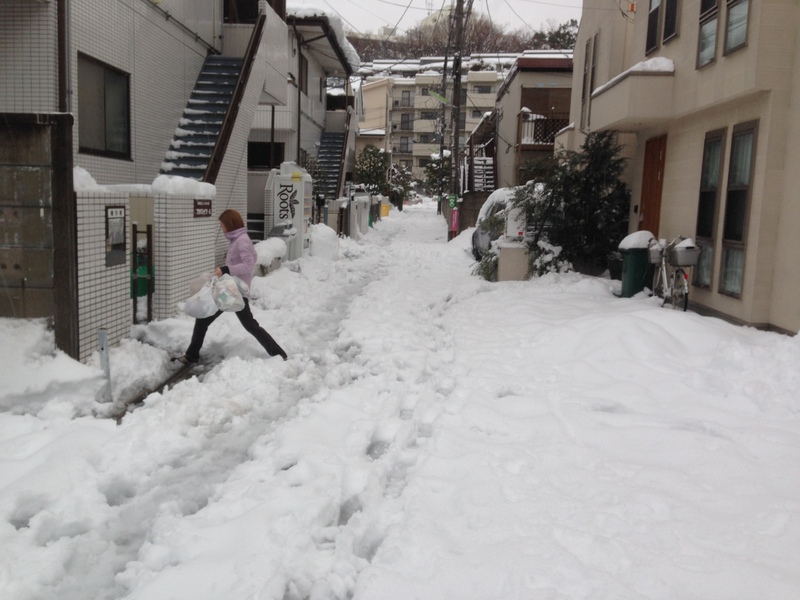 Global Warming and Increasing Co2 Dump Nearly 9 inches (22 cm) of Snow on Tokyo in Less Than 24 Hours! Global Warming and Climate Change have become the critical issue of our times. The changes are coming quicker and quicker. The last 24 hours makes two weeks in a row that Tokyo has set records for snowfall in February. The government must increase our taxes so that they can fix the climate like they’ve fixed our economy. 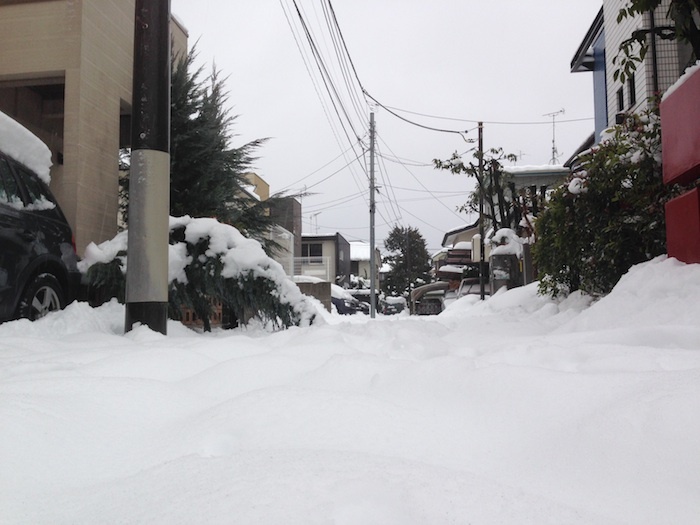 TOKYO — The heaviest snow in two decades struck Tokyo and other areas across Japan on Saturday, leaving three dead and nearly 500 others injured in 29 prefectures, reports said. More than 740 flights were grounded as the weather agency issued a severe storm warning for the capital, while more than 40,000 households lost power. 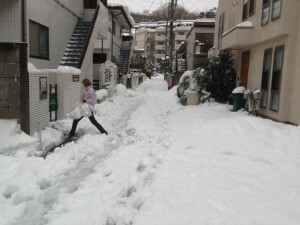 As much as 22 centimeters of snow was recorded Saturday afternoon in Tokyo, topping 20 centimeters for the first time since 1994, the meteorological agency and news reports said. Well, I’m not sure about all of Tokyo and most of Japan, but I am sure that this is the most snow I have ever witnessed in the Tokyo Yokohama area in 30 years and…. 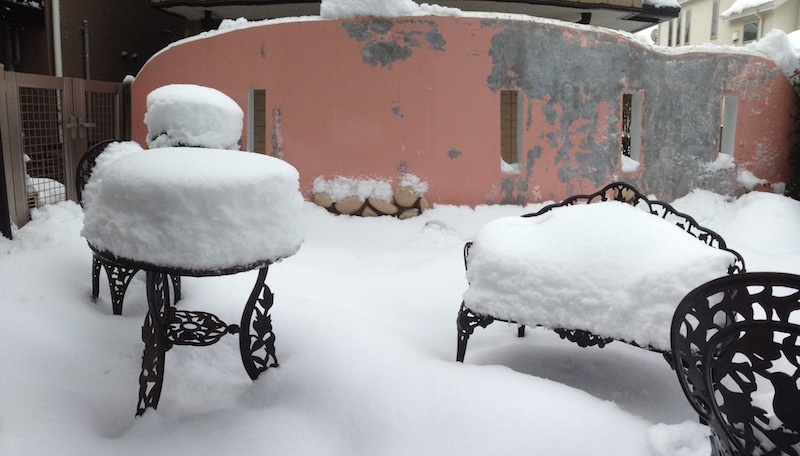 My back patio… I guess there’s no BBQ nor lounging around there today! Well, OK, I did force the front gate open and took these photos for you. 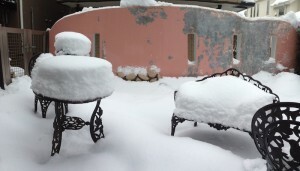 This is my front patio area. THis is up the street. Don’t worry lady, they aren’t coming to pick up the trash today! 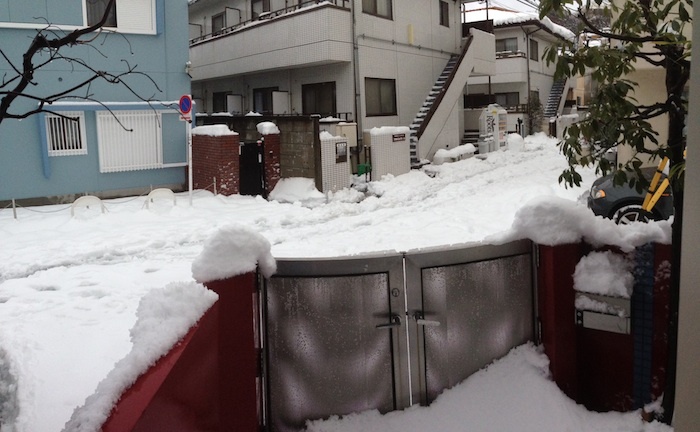 Not in this heavy snow, they aren’t… This makes two Saturdays in a row for that too! Don’t worry lady, no trash pick up today! 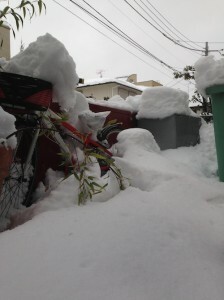 But, then again, maybe I won’t be taking the car out. 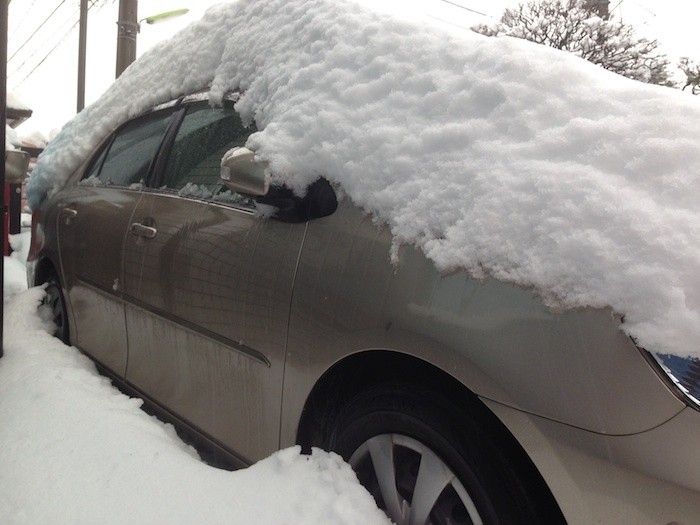 Nobody else will either, even if they have snow tires… No one is going anywhere in this snow. As everyone knows, and it goes without argument, consideration or debate that, Global Warming (now conveniently called “Climate Change”) causes the world to get warmer and colder. Some will claim that 95% of the World’s Scientists All Agree that the world is getting warmer and it is the fault of man. Read here about 31,000 scientists as well as 9,029 with PhDs, who think the earth is flat here. Breakfast at the Rogers’ house. 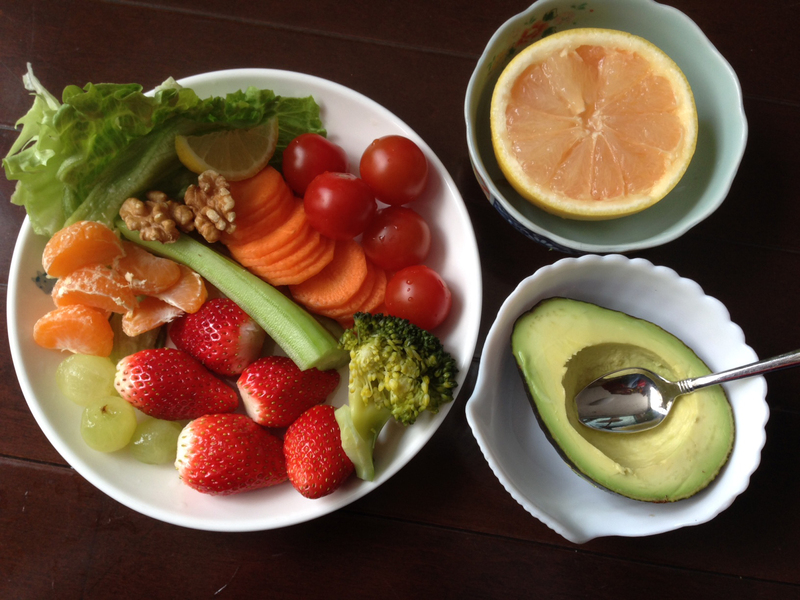 Raw lettuce, carrots, cucumbers, avocado, grapes, tangerines, lemon slice, tomatoes, walnuts, strawberries, grapefruit and (slightly boiled) broccoli along with homemade juice (not pictured) consisting of: cabbage, tomatoes, ginger root, bananas, broccoli, oranges, lemons. My son eats this everyday, every meal. Keep your and your child’s health in balance by eating like this always. No processed or fast foods! They’ll be happier, healthier and their brains won’t be fried by chemicals. Read more: People Are Poisoning Themselves and Their Own Children at Breakfast. Are You One of Them? Japan has now definitively surpassed the USA as the world’s #1 music market. 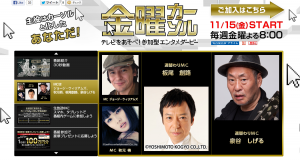 I’ve written repeatedly about the music market in Japan. One of my favorites is here: Why Good UK and USA (Western) Independent and Alternative Artists Cannot Get Record or Publishing Deals in Japan. Now, I’ve found a wonderful article that backs me up. Happy New Year 2014! The Year of the “Hose”! Horse in Japanese is “uma.” When a Japanese studies English, they learn that “uma,” in English, is pronounced: “ho-su.” Which, you can probably guess, is the same pronunciation – and the same word – as the garden watering device… Also, hence, the pose that looks like I might be “riding” the hose. The joke really gets to be an “inside joke” when you realize that in the red circle at the top right, there is a mix of the Japanese alphabet “Hiragana” (the language for Japanese things) for the “ho” and in Katakana for the “su.” It’s a curve ball! It’s a 13-year-old level joke, but I think it wouldn’t occur to most Japanese so some of them think it’s hilarious! WelI, as we all know, a joke that must be explained isn’t that funny… I guess, you’d have to be here to appreciate it! Anyway, have a safe and Happy New Year! May all your dreams come true in 2014! I made this silly photo comparison. It speaks for itself. 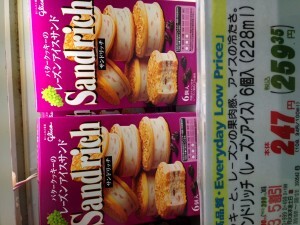 OK, there’s Japanglish, where the Japanese do their darndest to try to get it right…. And don’t but it works anyway…. 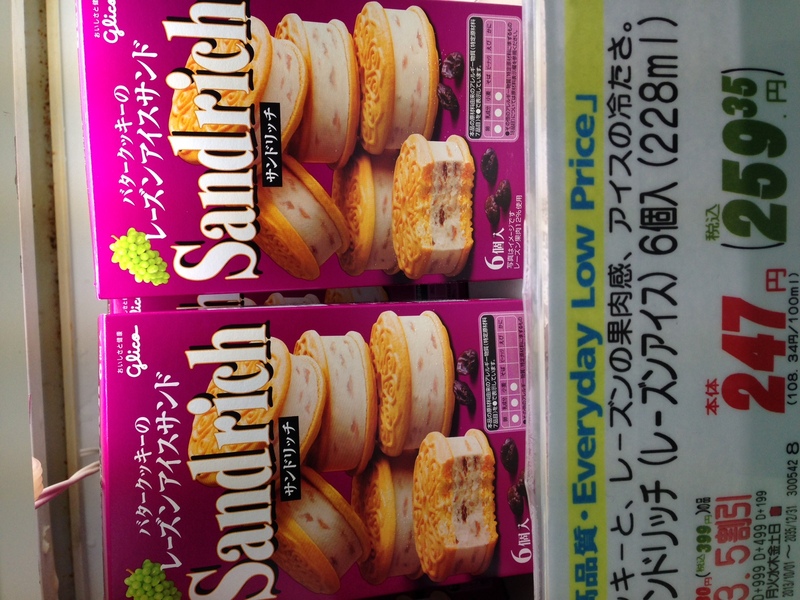 Then there’s Japanglish, where the Japanese do their darndest to try to get it right…. 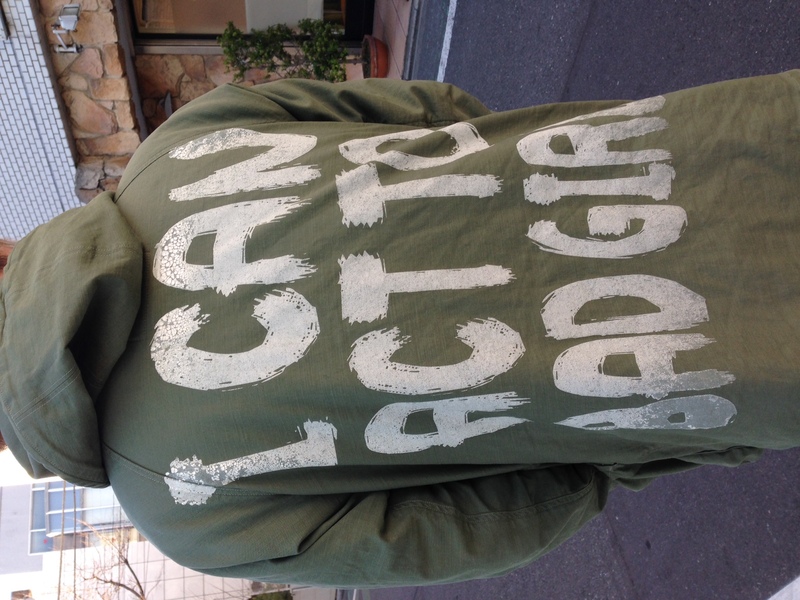 But fail miserably… “I can act to bad girl”? What the heck does that mean? There’s an article at Bloomberg today that verifies what I’ve been saying since December of 2012: Abenomics is failing and is having the exact opposite effect of what was intended. Japan’s inflation accelerated to the fastest pace since 2008 in August on higher energy costs, underscoring pressure on Prime Minister Shinzo Abe to drive wage increases as he seeks to end 15 years of deflation. Consumer prices excluding fresh food increased 0.8 percent from a year earlier, the statistics bureau said today in Tokyo. The median forecast of 30 economists surveyed by Bloomberg News was for a gain of 0.7 percent. Stripping out energy and perishables, prices fell 0.1 percent. While, on the surface, and looking at just the core CPI, people are happy about Abenomics, but the cheerleaders are conspicuously silent; a quick peak under the surface shows why as there are massive problems building up. Abenomics is supposed to devalue to currency to increase exports all the while wages increase are supposed to help the Japanese public spend more thereby turbo-charging the domestic market. But it isn’t working out that way at all. First off all, Japan’s Trade Deficit was massively in the red for the 14th straight month in a row and hit a historical deficit record at the same time. For the eight month period, the trade deficit hit a record of ¥6.8 trillion, up 66% from the same period in 2012, and up 332% from 2011. 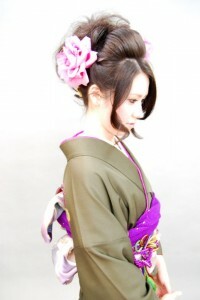 During that period in 2010, Japan had a surplus of ¥4.2 trillion! Japan’s trade fiasco is on a steep downward slope. August was the worst August ever, July the worst July ever, June the worst June ever…. There’s no discernible turning point on the horizon. Salaries in July extended the longest slide since 2010, with regular wages excluding overtime and bonuses falling 0.4 percent from a year earlier, a 14th straight drop. Not only are wages declining, while energy (and food) costs are rising, there’s a double whammy of a 40% Sales Tax just around the corner! The yen’s 20 percent slide against the dollar in the year through August pushed up fuel costs. While the data point to early success for Abe, a sales-tax increase scheduled for April will add to the burden on households and risk dragging on the nation’s economic rebound. Abe is set to announce a decision on the levy on Oct. 1. 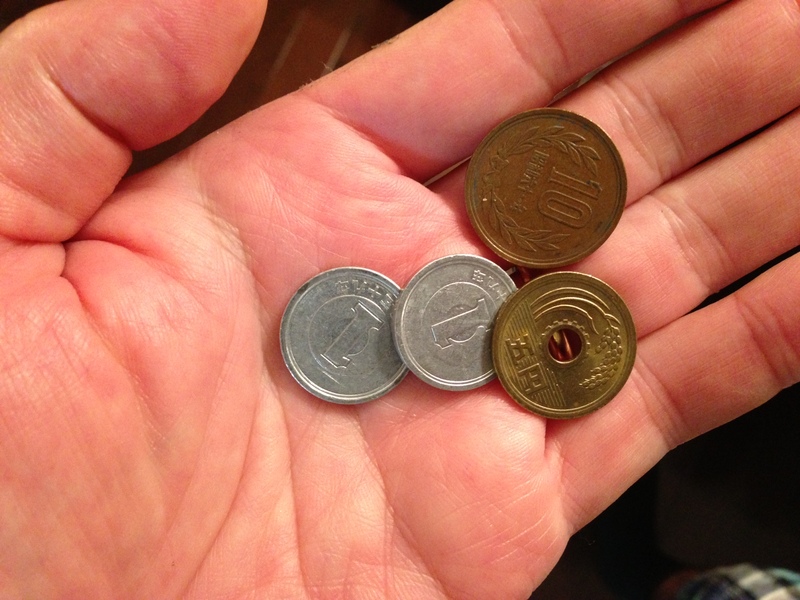 In this insane Keynesian experiment that Abe is trying, wages are supposed to rise along with inflation. 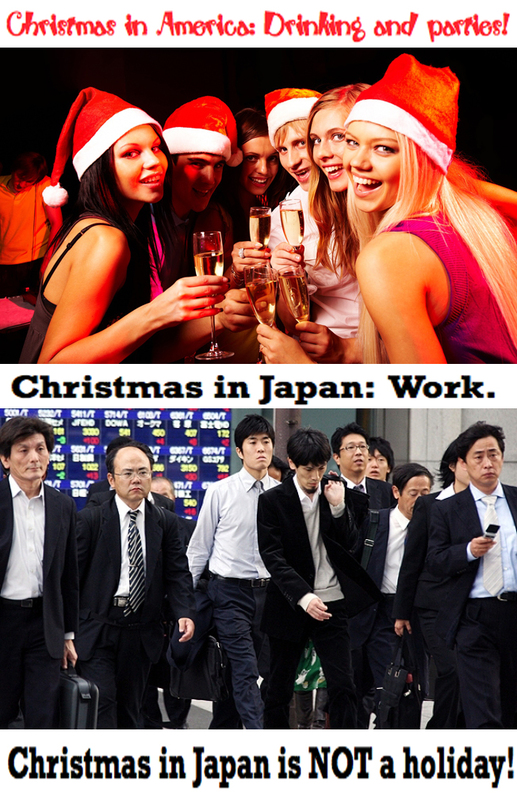 In Japan, the opposite is happening. This, again, is simple mathematics, folks…. We are witnessing a slow-motion train wreck in Japan. The good news is consumer confidence is also way down in Japan (for the third month in a row)… Which is usually a precursor to a change in government…. …Consumer confidence fell in August for a third consecutive month, and sentiment among merchants declined for a fifth month. The average consumer confidence drops for three months in a row, amongst all the Abenomics recent good news? (polite laughter and applause here, please!) And amongst merchants, it drops for 5 months in a row, and people say I’m negative? Yes, OK. Fair enough. 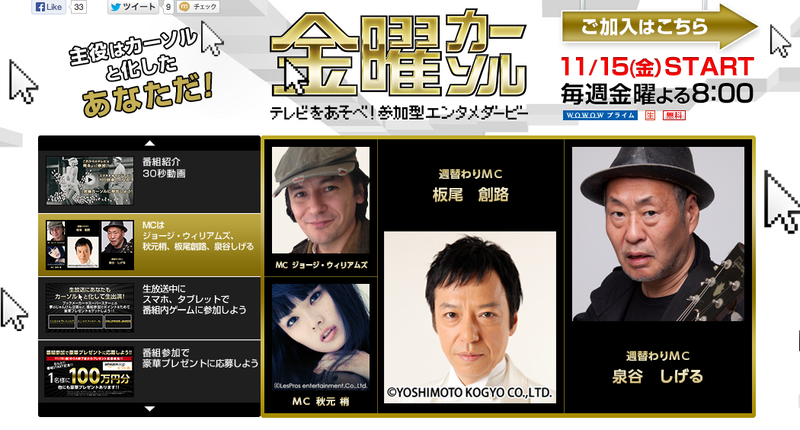 I may be negative on Abenomics, but I work amongst the Japanese and hear what they say and talk about. I’m no more negative than they are. I just report the facts. Just the facts, ma’am! Like I said, the best thing here in the news is the drop in confidence part. Why? A drop in confidence amongst the Japanese has always lead to a change in government… But, alas, in Japan’s case, and judging from recent history, a change in government won’t help… It’s too late to fix the debt to GDP problem, energy costs are skyrocketing, the nuclear power plants aren’t coming online anytime soon (and even if they did, that’s not exactly good news, is it?) and the system is broken. Any new government of Japan will be more of the same: Meet the new boss, same as the old boss… Japan’s problem isn’t this political party or that… Japan’s problem is the government. There’s a storm coming, folks. ©copyright Universal Vision Ltd. All Rights Reserved.